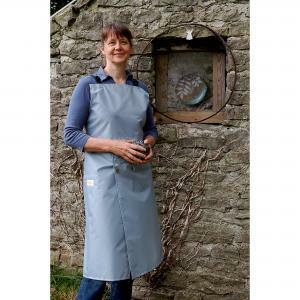 Welcome to the new, improved PotApron, a split-leg apron for potters. Designed by potters for potters. The new-design PotAprons feature clips: You can now attach any towel of your own choosing. PotAprons are stylish, comfortable and safe for use in the pottery. Waterproof, durable, practical, convenient and safe. "The PotApron is great because it's made in line with industry best practice in respect of managing exposure to silica dust. Fabrics made from natural fibres, such as cotton, retain the finest, most dangerous silica dust in their fibres, even after washing." James Otter, Director, Potclays Ltd.